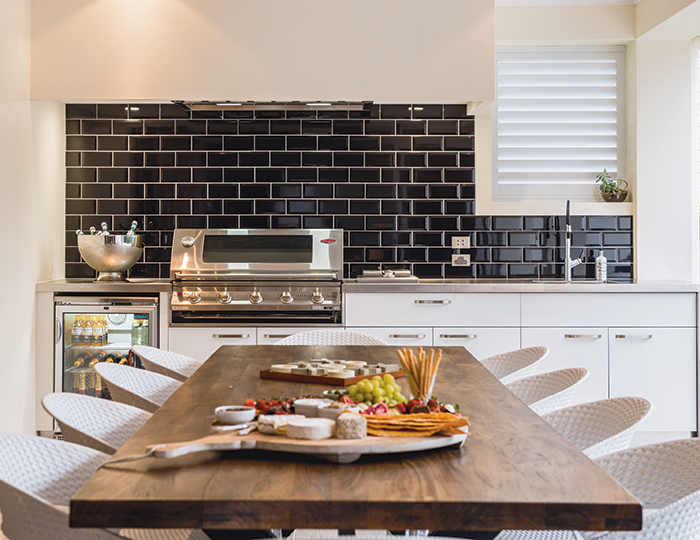 ‘Alfresco dining’ was the inspiration behind this gorgeous kitchen creation by Condari and Designer Kitchens. 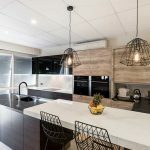 The owners sought an in vogue design that was also highly functional, and spared no expense in creating a space that would perfectly complement their home and lifestyle. While no major structural work or remodelling was required, a small existing wall was extended to fully enclose the defining features of the the new alfresco outdoor kitchen/entertaining space – a six burner Beefeater barbecue and wok burner, to keep them protected from the elements. Correct ventilation was a key consideration at design stage. As barbeques these days have increased in size and complexity and have extremely high heat output, people often create outdoor areas without applying the right ingenuity – only to get smoked out when barbecuing. 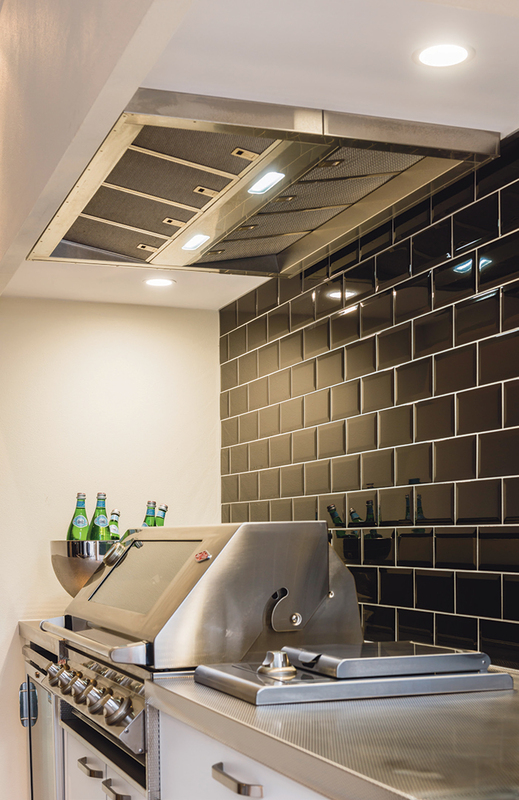 An integrated Condor rangehood was installed above the barbecue to extract the smoke when cooking. 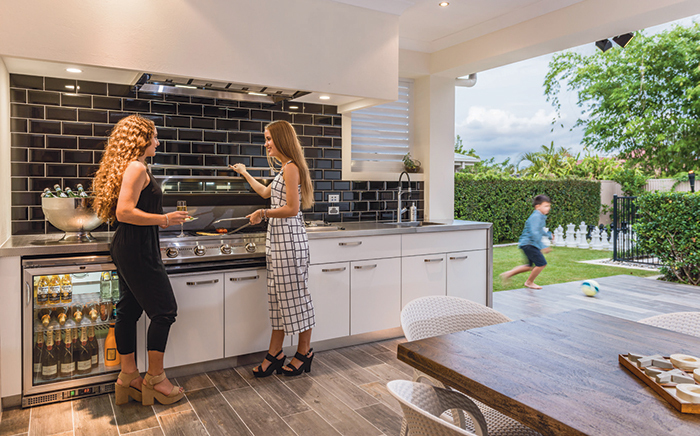 Designed and manufactured in Australia, Condor Rangehoods by Condari feature a beautiful, sleek design and are adept at removing all by-products of outdoor cooking. 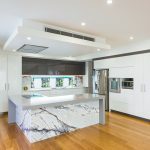 Three motors are fitted to each rangehood with a maximum air movement of 2,550 cubic metres of air per hour. Each Condor is also fitted with a special silencing material to ensure quiet operation at all times. 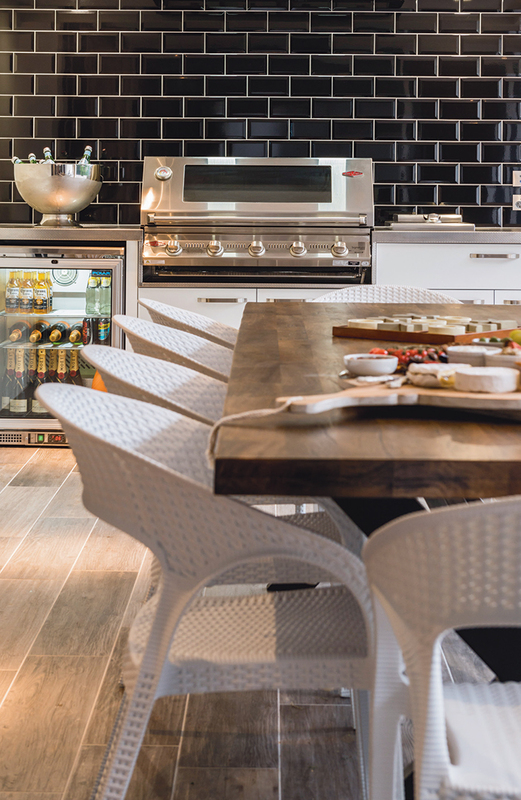 The outdoor kitchen area features loads of bench space for easy food preparation. 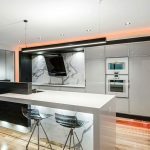 Task lighting has been designed into the bulkhead and is positioned over the working zone (barbecue, wok and benchtops) for added practicality. 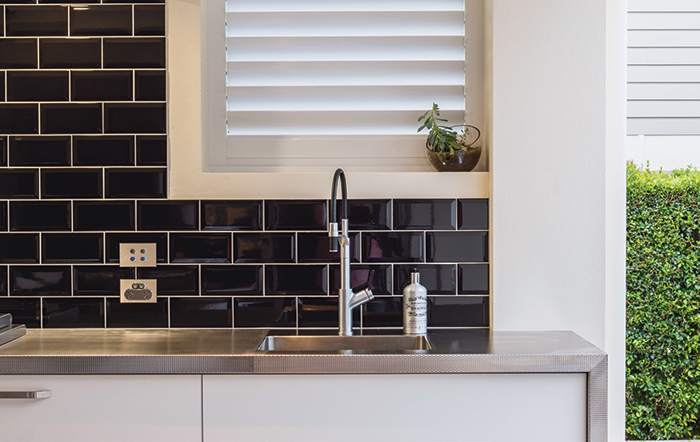 Black gloss subway tiles adorn the splashback for a modern aesthetic, while wood-grain floor tiles add warmth with the look of timber but the practicality of a tiled surface to make for easier cleaning. 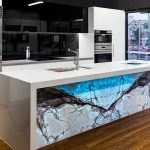 Stainless steel appliances have been teamed with Oliveri sink and tapware and white cabinetry featuring aluminium edging to create a harmonious and stylish look. Aluminium edging is highly suitable for outdoor use as it makes cabinet doors more rigid, ensuring they won’t warp or twist when exposed to the elements.